DUBAI CRISIS ROCKS GLOBAL MARKETS – 27/11/2009. The Dubai Financial crisis hit the global markets by Thursday and as a result the global markets underwent a major dip. The Dubai debt crisis has its roots in the global financial meltdown which started from Jan 2008, but the tremors of that crisis were only felt now. In a knee jerk reaction, not only the global markets went down by 4-5%, but the U.S. dollar started rallying and as a result the impact was seen on the prices of crude, gold and other commodities. In the early part of the week the Chinese banks gave a scare for a want of capital inducement and the weekend saw the Dubai banks being degraded because of the financial mess in Dubai. No doubt the exposure of various financial institutions and other companies having direct exposure to the Dubai market weakened the sentiments. But the Indian companies will be less affected as compared to their Global and Asian peers, which have more exposure to Dubai. Inspite of the fact that the Indian companies will be relatively less affected, it has given our market a reason to correct, which it was searching for. The Dubai financial crisis is just the reason the market was searching for to correct. The long term trend continues to be up and hence the correction should be used to enter long positions in good frontline stocks. The short to medium term trend has turned down as both the indices have managed to close below their 50dmas (Sensex – 16742 & Nifty – 4970). For short to medium term trend to reverse, it is imperative that the indices close above their respective 50dma as a first step and then crossover the immediate high of Sensex 17290 and Nifty 5138. 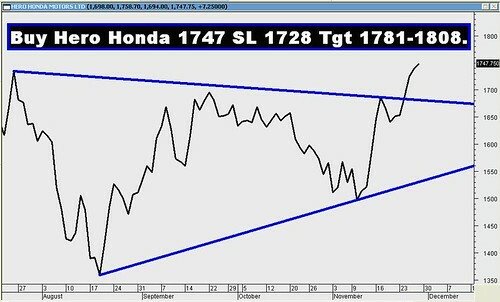 The Sensex opened the week at 17067, made a high of 17290, a low of 16210 and closed the week at 16632. The Sensex closed the week with a loss of 389 points. The Sensex has formed a Bearish Engulfing pattern on the weekly charts completely engulfing the previous week’s small white body. The Stalled pattern formed by previous three weeks white candle gave a bearish confirmation by the formation of Bearish Engulfing pattern, which signaled the short to medium term trend to have turned down. On the daily charts, there is slight opposition to the weekly formation as it has formed a hammer with a small black body. From a very short term perspective, the hammer signals a bullish reversal and for this Bullish reversal to sustain, the low made by the hammer (16210) should not be breached. Sensex has taken support at the Trendline joining the low made in March (8047) to the recent low made in November (15330) and reversed from there. This Trendline is ably supported by the 100dma which coincides with it. Hence this Trendline is acting as a demand line and hence should not be breached. The short to medium term trend has turned down as the Sensex has closed below the 50dma (16742). Hence for the short to medium term trend to reverse, it is necessary that the Sensex closes above the 50dma and also above the Trendline joining the recent highs which falls at 17262. After the election results it has been observed that the Sensex has been moving in an upward sloping channel. If we consider the lower end of the channel which falls at 15872, then that level should act as strong support. In case this support gets broken, then the target on the lower side can be as low as 13737. The Sensex until now has been moving in a higher top, higher bottom formation but the recent high of 17290 is a lower top as compared to the previous top of 17493, but this lower top will be confirmed only when the Sensex breaches the immediate higher bottom of 15330. Then in that case, the Sensex will have a trajectory of lower top and lower bottom formation. Then the Sensex will correct the entire rise from 7697 to 17493, for which the correction levels will be 13751-12595-11439. The Sensex has formed a Bullish Inverted Head & Shoulder pattern on the weekly charts and this bullish formation will not be disturbed as long as Sensex remains above the neckline at 15613. The indicators like ROC and RSI have given sell signal. The MACD has become weak but is yet to give a sell signal. The Money Flow Index was the only indicator in the last week which was giving a Sell signal with a formation of an intermittent top. It was almost at 92 when the market started to come down. It clearly showed distribution at higher levels. On Wednesday, the Directional Indicators once again crossed over, but this time gave a sell signal as the +DI cut the –DI from above. It indicated to go short keeping a stop loss of 17290. The Sensex has Trendline Resistance at 16863-17262 and Trendline Support at 15872-15583. For the week ahead, Sensex will face Resistance at 16863-17098-17290. Sensex will find Support at 16494-16210-15788. The Nifty opened the week at 5052, made a high of 5138, a low of 4806 and closed the week at 4941. The Nifty closed the week with a loss of 111 points. The Nifty has formed a Bearish Engulfing pattern on the weekly charts completely engulfing the previous week’s small white body. Trendline joining the low made in March (2539) to the recent low made in November (4538) and reversed from there. This Trendline is ably supported by the 100dma which coincides with it. 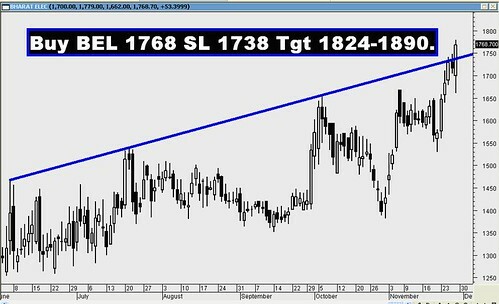 Hence this Trendline is acting as a demand line and hence should not be breached. The short to medium term trend has turned down as the Nifty has closed below the 50dma (4970). Hence for the short to medium term trend to reverse, it is necessary that the Nifty closes above the 50dma and also above the Trendline joining the recent highs which falls at 5131. 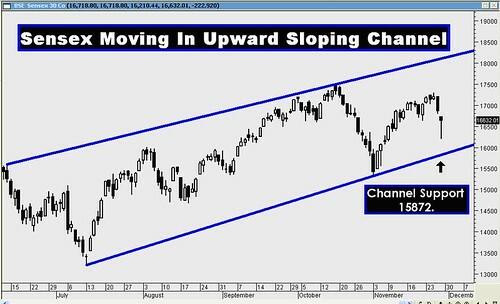 After the election results it has been observed that the Nifty has been moving in an upward sloping channel. If we consider the lower end of the channel which falls at 4694, then that level should act as strong support. In case this support gets broken, then the target on the lower side can be as low as 4180. The Nifty until now has been moving in a higher top, higher bottom formation but the recent high of 5138 is a lower top as compared to the previous top of 5181, but this lower top will be confirmed only when the Nifty breaches the immediate higher bottom of 4538. Then in that case, the Nifty will have a trajectory of lower top and lower bottom formation. Then the Nifty will correct the entire rise from 2252 to 5181, for which the correction levels will be 4062-3716-3371. The Nifty has formed a Bullish Inverted Head & Shoulder pattern on the weekly charts and this bullish formation will not be disturbed as long as Nifty remains above the neckline at 4718. The indicators like ROC and RSI have given sell signal. The MACD has become weak but is yet to give a sell signal. The Money Flow Index was the only indicator in the last week which was giving a Sell signal with a formation of an intermittent top. It was almost at 92 when the market started to come down. It clearly showed distribution at higher levels. On Wednesday, the directional indicators once again crossed over, but this time gave a sell signal as the +DI cut the –DI from above. It indicated to go short keeping a stop loss of 5138. The Nifty has Trendline Resistance at 5131-5050 and Trendline Support at 4694-4610. The O.I.PCR is at 1.43 which still suggests some bullish exuberance remains. Strong PUT writing is visible at 4800 and 4500 strikes, which may act as strong support levels in case of further downfall. CALL writing at 5000 strike price means that the market may find it difficult to cross that level. For the week ahead, Nifty will face resistance at 5016-5079-5138. Nifty will find support at 4904-4786-4671.